11th lunar month of 1788: he makes his first appearance on stage, receiving the name of Onoe Eizaburô I. 8th lunar month of 1803: premiere at the Nakamuraza of Sakurada Jisuke I's drama "Banzui Chôbê Shôjin Manaita"; Eizaburô plays the role of the yakko Matahei [casting]. 7th lunar month of 1808: premiere at the Ichimuraza of Katsu Hyôzô I's drama "Toki-mo Kikyô Shusse no Ukejô"; Eizaburô plays the role of Mori no Ranmaru [casting]. 1st lunar month of 1809: Eizaburô plays at the Moritaza the roles of Soga Jûrô Sukenari and Iba no Jûzô in the new year sogamono "Gohiiki Aratama Soga"; the roles of Soga Gorô Tokimune and Kudô Saemon Suketsune are played by Onoe Monzaburô II and Bandô Mitsugorô III. 3rd lunar month of 1809: premiere at the Moritaza of Fukumori Kyûsuke I's drama "Sono Mukashi Koi no Edo-zome"; Eizaburô plays the roles of Kichisaburô and Goshaku Somegorô [casting]. 11th lunar month of 1809: great shûmei at the Ichimuraza for the Otowaya guild; Onoe Matsusuke I and Onoe Eizaburô I take the respective names of Onoe Shôroku I and Onoe Matsusuke II. His son makes his first stage appearance, receiving the name of Onoe Eizaburô II. 1st lunar month of 1810: premiere at the Ichimuraza of Tsuruya Nanboku IV and Sakurada Jisuke II drama "Kokoro no Nazo Toketa Iroito"; Matsusuke plays the role of Omatsuri Sashichi [casting]. 3rd lunar month of 1810: premiere at the Ichimuraza of Katsu Hyôzô I's drama "Kachi Zumô Ukina no Hanabure" (commonly called "Shirafuji Genta"); Matsusuke plays the role of Tsugawa Mondo [casting]. 5th lunar month of 1810: premiere at the Ichimuraza of Katsu Hyôzô I and Sakurada Jisuke II drama "Ehon Gappô-ga-Tsuji"; Matsusuke plays the roles of Unzari Omatsu and Yohei [casting]. 11th lunar month of 1814: Onoe Matsusuke II and his son Onoe Eizaburô II take the respective names of Onoe Baikô III and Onoe Matsusuke III at the Nakamuraza, playing in the drama "Ninin Muko Mikurai Sadame". 10th lunar month of 1815: his adoptive father Onoe Shôroku I dies. 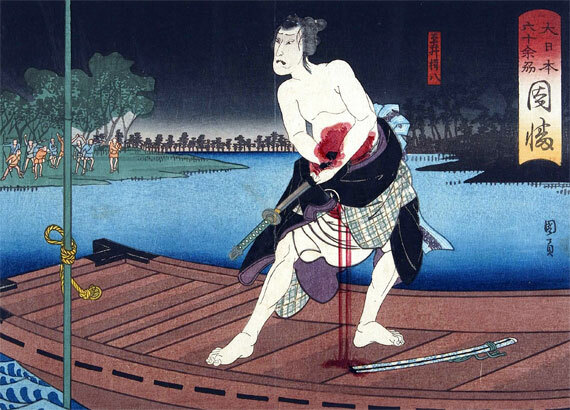 11th lunar month of 1815: Onoe Baikô III takes the name of Onoe Kikugorô III at the Nakamuraza, performing several role, including the spectacular spirit of the Earth-Spider, in Fukumori Kyûsuke I's kaomise drama "Shitennô Oedo no Kaburaya". 1st lunar month of 1816: premiere at the Nakamuraza of the new year sogamono "Hiyoku no Chô Haru no Soga Giku". This new year drama mixed two sekai: it was a sogamono and a gonpachi-komurasakimono. The sogamono fell into oblivion and the gonpachi-komurasakimono was staged independently under the title "Sono Kouta Yume mo Yoshiwara" ("Gonge" and "Gonjô"); Kikugorô plays the roles of Kudô Saemon Suketsune, Shiratsuka Jûemon, Komurasaki and Honjô Sukeichi [more details]. 3rd lunar month of 1818: premiere at the Miyakoza of the 7-role hengemono "Miyama no Hana Todokanu Edaburi", starring Kikugorô in the seven roles. One of these roles is "Kosode Monogurui" ("the short-sleeved garment madness"), staged nowadays as an independent Kiyomoto-based dance called "Yasuna". 3rd lunar month of 1820: premiere at the Tamagawaza of Tsuruya Nanboku IV's drama "Sakura Butai Maku no Datezome"; Kikugorô plays the roles of Akamatsu Hikojirô, Nikki Danjô, Kosuke, Masaoka and Ashikaga Sakingo Yorikane [casting]. 9th lunar month of 1821: premiere at the Kawarasakiza of Tsuruya Nanboku IV's drama "Kiku no En Tsuki no Shiranami". The main role (Sadakurô) is played by Kikugorô. 11th lunar month of 1821 (end of the month): premiere at the Kawarasakiza of Tsuruya Nanboku IV's drama "Imoseyama Hitome Senbon", which mixes the "Yoshitsune Senbon Zakura" and "Imoseyama Onna Teikin" worlds; Kikugorô plays the roles of Satô Tadanobu, Igami no Gonta, Kajiwara Genta Kagesue, Nasu no Yoichi and the farmer Fukashichi [casting]. 12th lunar month of 1822: premiere at at the Ichimuraza of the danmari "Ichiharano no Danmari"; Kikugorô plays the role of Hirai Yasumasa [more details]. 3rd lunar month of 1823: premiere at the Ichimuraza of Tsuruya Nanboku IV's drama "Ukiyogara Hiyoku no Inazuma"; Kikugorô plays the roles of Nagoya Sanza and the courtesan Miuraya Komurasaki [casting]. 6th lunar month of 1823: premiere at the Moritaza of Tsuruya Nanboku IV's drama "Kesakake Matsu Narita no Riken", starring Kikugorô and Ichikawa Danjûrô VII in the roles of Kasane and Yoemon. The michiyuki, commonly called "Iro Moyô Chotto Karimame", is still regularly performed. 7th lunar month of 1825: Kikugorô plays at the Nakamuraza the roles of Ôboshi Yuranosuke, Hayano Kanpei and Tonase in the drama "Kanadehon Chûshingura". 7th lunar month of 1825: premiere at the Nakamuraza of Tsuruya Nanboku IV's ghost play "Tôkaidô Yotsuya Kaidan"; Kikugorô plays the roles of Iemon's wife Oiwa, Kobotoke Kohei and Satô Yomoshichi [casting]. 6th lunar month of 1827: premiere at the Kawarasakiza of Tsuruya Nanboku IV's drama "Hitori Tabi Gojûsan Tsugi"; Kikugorô plays the roles of the umakata Sankichi (in reality Date no Yohachirô, later Nippon Daemon using the name of Kuwanaya Tokuzô), Akibayama no Sanjakubô, the carpenter Konishi no Hachi, Hirai Gonpachi and Takemura Sadanoshin [casting]. 11th lunar month of 1830: Kikugorô plays the role of Kan Shôjô in the classic "Sugawara Denju Tenarai Kagami", which is performed at the Kitagawa no Shibai (Kyôto). he also plays the roles of Shizuka Gozen and Igami no Gonta in the classic "Yoshitsune Senbon Zakura". 8th lunar month of 1841: Kikugorô plays at the Ônishi no Shibai (Ôsaka) the roles of Ôboshi Yuranosuke, Kô no Moronô, Hayano Kanpei and Tonase in the drama "Kanadehon Chûshingura". He also plays the roles of Sakuramaru, Takebe Genzô and Kan Shôjô in "Sugawara Denju Tenarai Kagami". The roles of Okaru, Tonami and Yae are played by Arashi Tokusaburô III. 9th lunar month of 1841: Kikugorô plays in the same theater the roles of Tokubê and Kikuichi in the drama "Tenjiku Tokubê Ikoku Banashi". He also plays the roles of Oiwa, Kohei and Yomoshichi in "Tôkaidô Yotsuya Kaidan". 7th lunar month of 1847: Kikugorô appears on stage for the last time, at the Ichimuraza in a great program called "Onoe Baiju Ichidai Banashi", which commemorates the 32nd anniversary (33rd memorial service) of late Onoe Shôroku I. Kikugorô retires and becomes the owner of a mochi shop, calling himself Kikuya Manbê. 4th lunar month of 1848: he is back on stage, playing under the name of Ôgawa Hashizô I. 8th lunar month of 1848: tour in Nagoya; then he settles in Ôsaka. 24th day of the 4th lunar month of 1849 : Hashizô falls suddenly ill while travelling on the Tôkaidô road; he dies at the Kakegawa station. Ôgawa Hashizô I was one of the first and most amazing kaneru yakusha in Kabuki history. The 24th day of the 4th lunar month of the 2nd year of the Kaei era was the 16th of May 1849 in the western calendar.